I have been a fan of Ming Tsai for a long time. His miso glazed Chilean sea bass still stands out as one of the best fish dishes I’ve ever had and if I find myself in Wellesley around lunchtime, you can be sure that I am slurping up a bowl of his ramen, a bowl of springy noodles in liquid pork goodness. So, when he opened Blue Dragon, an “Asian gastropub,” it went straight to the top of my to-go list. The Institute of Contemporary Art offers free admission on Thursday nights from 5-9pm and the restaurant is a short walk away, making it a perfect pairing for a warm summer evening. I still don’t understand modern art, but view of the water from the museum is worth the visit. I went with my friends Leslie and Sonia. Blue Dragon does not take reservations, but it was only a 20 minute wait at 7:30pm on a Thursday. 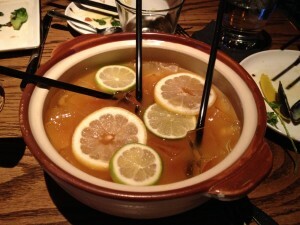 We started with a Dragon Bowl (their version of a scorpion bowl) – it was large, potent and delicious. It only thing it was missing was the fire. Indonesian Curried Lamb Shepherd’s Pie ($9) – The subtle sweetness of the coconut milk with a touch of curry was a new and different approach to this dish. It was Sonia’s favorite dish. 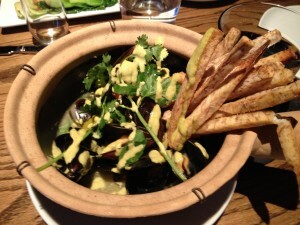 Beer-Steamed Mussels with Taro Fries ($12)– I liked the flavor of the mussels and broth, but it is a huge misstep to not provide bread to sop up the broth, which is always the best part of mussels. In fact, the deep round serving vessel made it difficult to even get at the broth. The Taro fries were novel, but still not as good as classic frites. 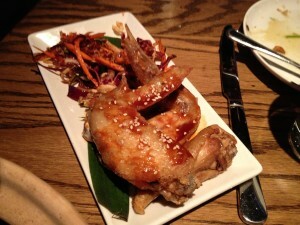 Korean Chicken Wings with Fresh Kimchee and Soy Glaze ($7) – The wings are quite good, but Bon Chon does it better. Dan Dan Noodles ($10)– The noodles were tasty, with just the right level of heat. This was the most filling of the dishes we got. Garlic-Ginger Bok Choy ($7)– The vegetables were beautiful presented – 7 baby bok choy laid out on a small rectangular plate, glistening with the ginger garlic glaze. Mama Tsoi would scream highway robbery if she knew what we paid for it. There is only one item available for dessert, a large chocolate chip cookie with vanilla ice cream. We passed on it. The servings were all small – I know it’s tapas style, but for the prices, the portions should be a little more generous. The restaurant is crowded and loud - we had to yell just to be heard at times. This is not a place to bring a date you are trying to get to know, but a fun place for drinks and sampling some different twist on foods you know.